We review the new adventure card game Mistfall, published by NSKN Games and Passport Games Studios. In this deck building, fantasy game, players must take on the roles of adventurers trying to beat the scenario's quest. It’s a world of mystery, eldritch powers, dire enemies, and powerful heroes. Welcome to Mistfall, a game where players must work together to survive perilous, monster-ridden locations. 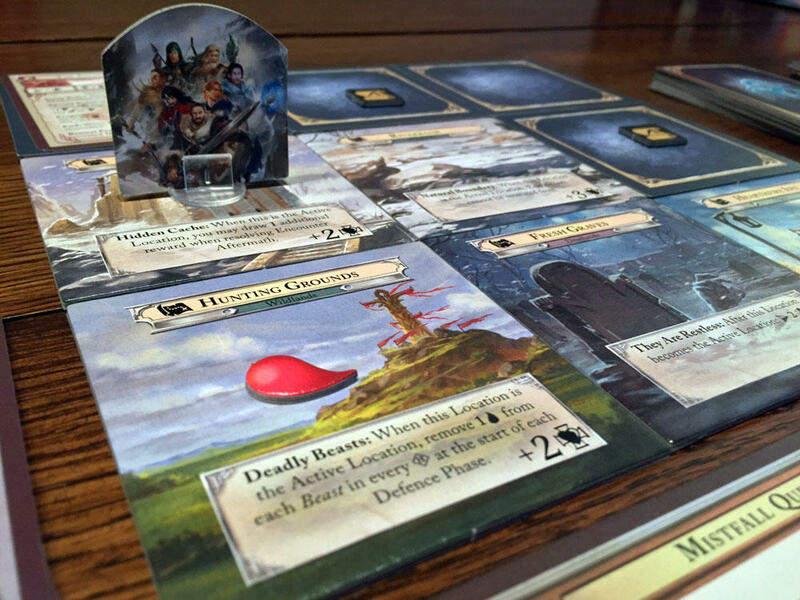 Mistfall is not just another dice-rolling, dungeon crawling board game. It’s a unique game where players take on the role of a hero, each with their own special abilities, equipment, and feats. Sound intriguing? That’s good because the high-fantasy genre has no shortage of games to entice potential game buyers. 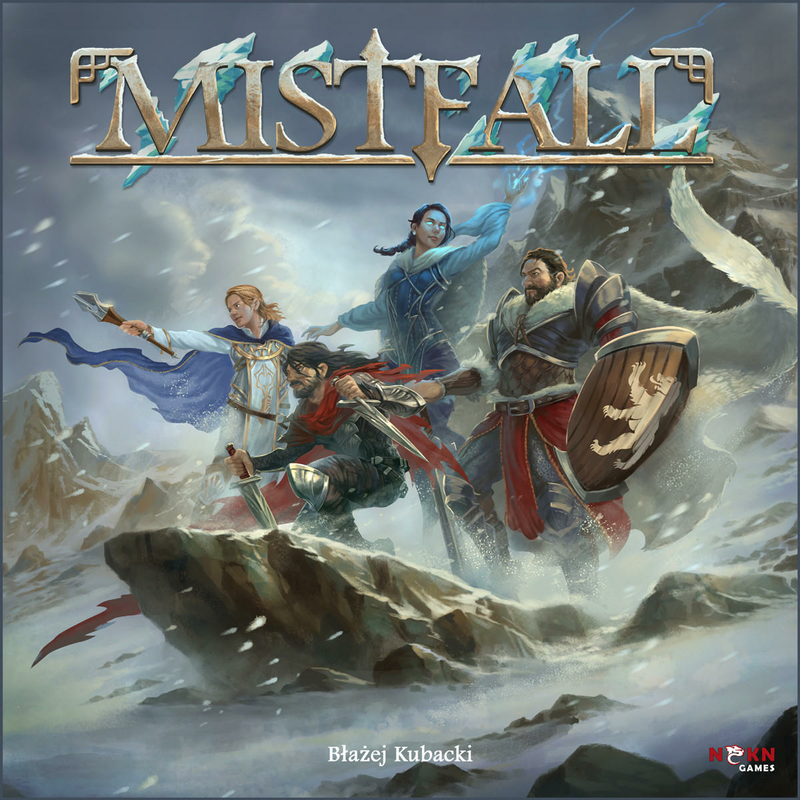 Designed by Błażej Kubacki, Mistfall promises a fully cooperative game with a good amount of variety and a strong challenge. Did publishers NSKN and Passport Games Studio succeed? It’s time to dive into this card game and find out. Mistfall is a cooperative, deck building fantasy game for 1-4 players that takes about 90-120 minutes to play. Mistfall plays best with 2-3 players. 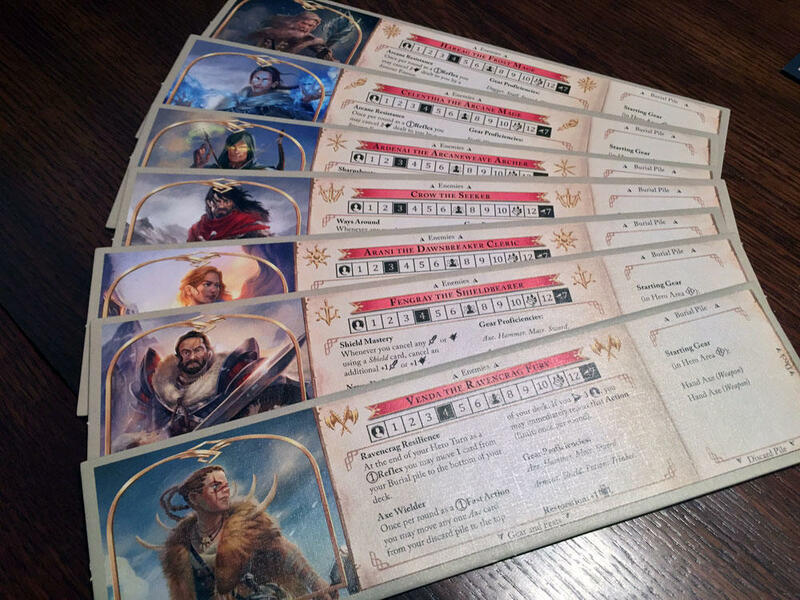 In Mistfall, each player assumes the role of a hero that must work together to complete the scenario’s objective. Many times this will involve traveling around the game’s world (in the form of randomized tiles) until they arrive at the special encounter location. Overcoming that final encounter will be the player’s goal. Each round players will be equipping their hero, fighting monsters, and discovering new locations. The monsters are controlled by a unique AI that determines who they attack and what special abilities they have. If the party can make it all the way to the quest end and (usually) defeat the main bad guy, they’ll win the game. Take too long or suffer too much damage and its game over for the heroes. Each character has their own unique character board, starting deck, rewards cards, and upgrade deck. I was pleasantly surprised with the amount of components that came with Mistfall. There were 7 different heroes to choose from among the usual fantasy icons you might expect (mage, fighter, ranger, etc.). Each hero has their own corresponding deck of cards (basic, upgrades, and gear) as well as a dual sided player board. 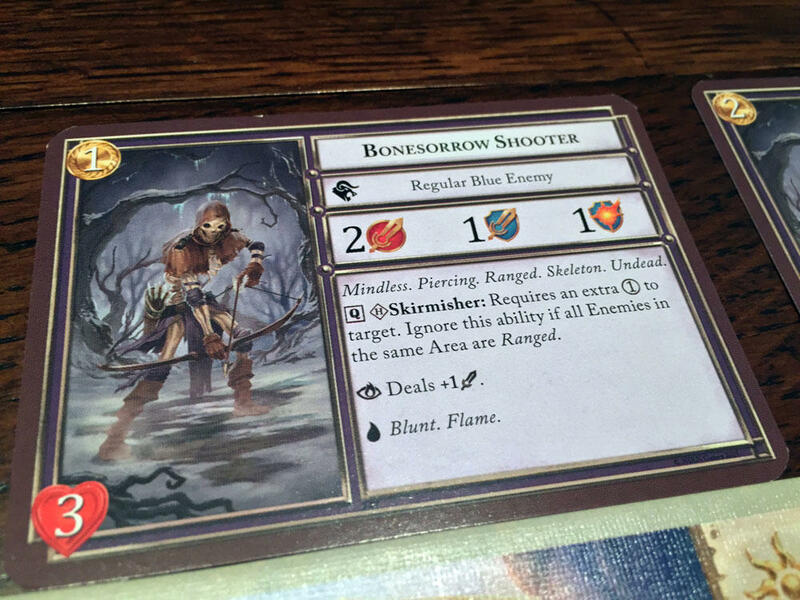 There are also over a hundred regular enemy cards, all with thematic artwork and text to show the creature’s stats and special abilities. To help give the game even more variety, there are a number of encounter cards, time cards and special enemy cards. The artwork in Mistfall is really well done. From the character portraits to the monster cards to the locations, it’s all fanatically illustrated and highly thematic. Instead of a game board, Mistfall comes with 22 unique location tiles that are randomized before every game. Many locations also have special rules that will affect game play while the adventuring party is on the tile. Finally, there’s the rulebook, 20 thick pages with lots of text. I’ll have plenty more to say on this in the game experience, but spoiler alert, it needs help, lots of it. 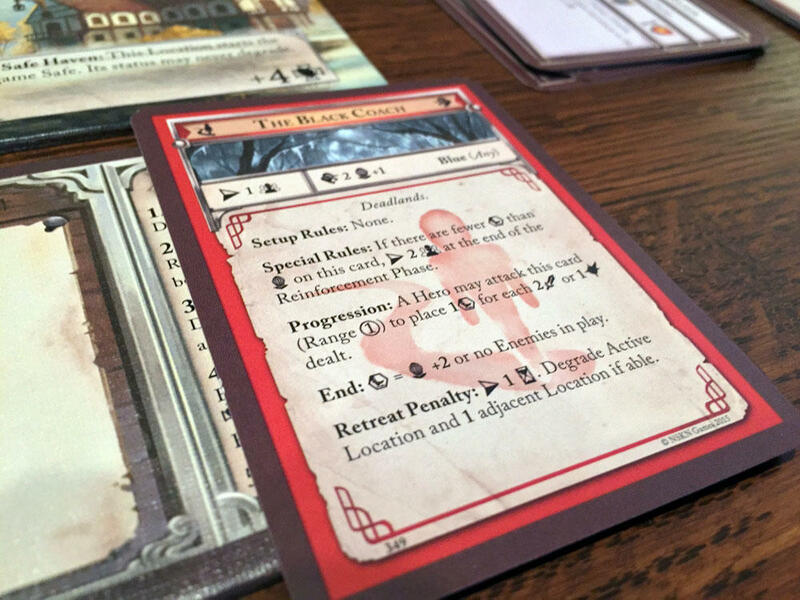 There are many different encounters in Mistfall, helping the games replay value. 1. Reinforcement Phase: If you have an active encounter, more enemies might come join the battle. 2. Travel Phase: Players can move their party marker to a new location. If the location is a perilous one, an encounter card is drawn. Encounter cards are like mini-missions. They spawn enemies into the game and outline special rules for defeating the encounter (which provides rewards for the heroes). 3. Pursuit Phase: Enemies from the encounter card are assigned to heroes based on their threat level. 4. Hero Phase: Each hero gets 1 regular action and as many fast or reflex actions as they want. Regular actions are along the lines of using a weapon, spell, or special ability. These are mostly used to attack monsters in a hero’s area. The fast and reflex actions can give players a bonus like boosting attacks, equipping weapons/armor, or drawing cards. Once a hero’s turn is finished, they draw cards up to their draw limit. 5: Defense Phase: Any monsters left alive attack the hero assigned to them. 6: Encounter Phase: If the encounter is completed (usually because all the enemies are gone or specific goals were met), players proceed to the aftermath. This is where rewards are handed out, heroes can rest, and any leftover enemies are discarded. If the encounter has not been completed yet, then this phase is skipped. 7. Time Phase: Draw a time card, move the time marker a specific number of steps, apply the event instructions (if any). Each monster is controlled by the game’s AI and has attack power, defense, and special abilities. Combat is handled via actions and using cards. Heroes can use any cards they have in play (or sometimes in hand). Each monster has a toughness and defense value (damage resistance). Do enough damage to a monster and it’s killed. When defeating a monster, a player gains resolve tokens, which can be used to purchase advance hero feat cards. When a monster damages a player, they must bury cards. If a player ever doesn’t have enough cards to bury, they die and it’s game over. Rounds continue in this manner until one of three things happen: A player dies, the time track reaches its end (in either case the players lose), or the special encounter has been beaten, in which case the players win! This is a high level overview for Mistfall. If you want to read all the nuts and bolts, you can download a PDF of the rules here. The world is made up from randomized tiles each game and each location can have their own unique, thematic properties. The first thing every gamer does when they get a new game (other than enjoy that great new game smell) is to flip through the rule book. I can usually tell right away what kind of learning experience I’m in for when I open a new rulebook. I’m ok reading the rules for a complex game, but when the organization and proofreading aren’t up to par, that makes for a rough experience. The Mistfall rulebook is fairly detailed, but contains both many typos and suffers from a lack of organization. 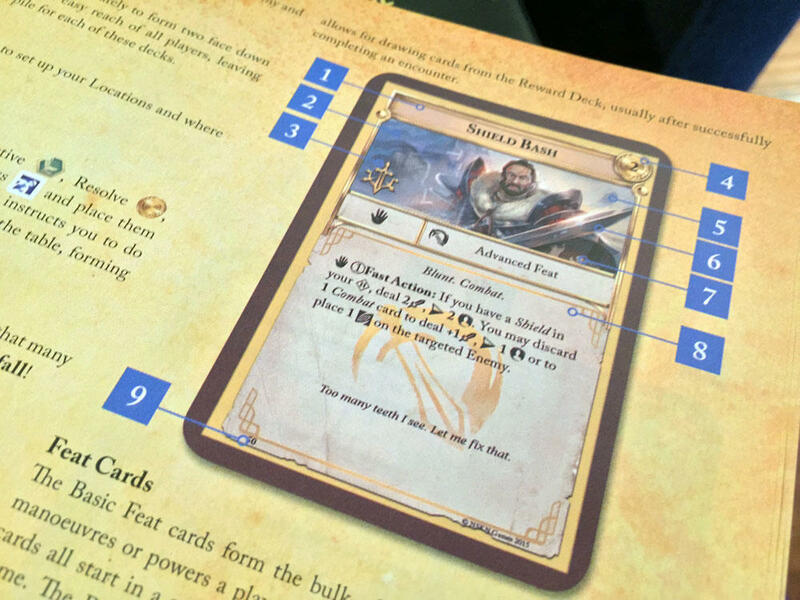 For example, there is a reference photo of a card in the rule book, but the reference arrows don’t actually point to the right spot. There are also misspellings, rules placed in odd locations, and a handful of card errata already necessary. It can be a bit of a challenge to make it through the rulebook and come away with a clear understanding of how to play the game. Typos and errata aside, the rulebook just can be hard to follow sometimes (and even more painful when used as a reference and index would have been really helpful). Curious if it was just me who was having issues learning, I popped over to the forums on BGG and had a look. What I found were over 200 separate posts on rules questions. That is a lot of confused gamers for a game that hasn’t even made it to retail yet! Fortunately, I was able to watch a few videos and use a really helpful PDF from a BGG user that let me finally wrap my head around how to play. It probably took me a full game (using the intro scenario) to really understand the game flow. It would be great if publisher NSKN to release an updated rulebook (PDF is fine) to make learning the game easier for new players. So that’s the bad news, but here’s the good news. Once you get a strong feel for Mistfall, it’s actually a good amount of fun. Other than card draws, the game isn’t strongly luck dependent. There is no dice rolling (like in the Pathfinder Adventure Card Game), so players are free to plan out their strategies and really take advance of the games great combo system. The combos are actually what I enjoyed about the game the most. Once you start building your deck up, you can really do some interesting things. 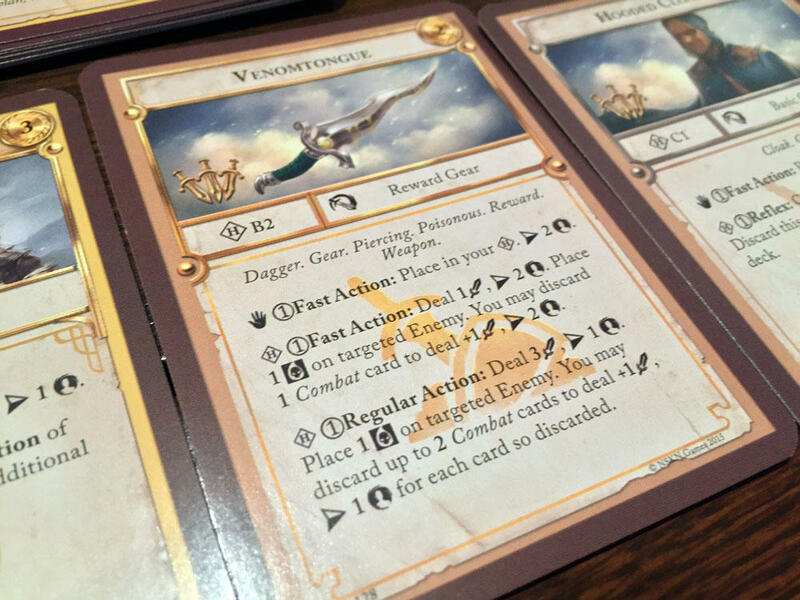 I did enjoy how players can choose which cards they buy from their advanced feat deck (and also how they go right into the players’ hand). This let me customize my character based on my strategies and not on a random draw. This is further enhanced in multiplayer games. 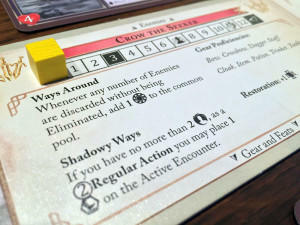 While Mistfall can be played solo, the game really needs at least 2 players (or even just 2 characters) to shine. The main reason is because many characters can combo off each other or can combine to gang up on one enemy. In one of my games, I did a solid amount of damage with the rogue, the cleric player then used a card to allow my rogue to get that super powerful card back in my hand and do it again. It’s times like this where Mistfall shows off just how much fun it can be. Another plus for Mistfall is the good amount of variety in the game. Between the really interesting encounter deck, the hundreds of enemies cards, and the randomized location tiles, no two games of Mistfall every feel the same (unless you count me losing often). The game also comes with a few different scenarios, and I’m having a great time going through all of them. Almost all the characters in Mistfall feel very unique and thematically built. Too add on to the variety, Mistfall also comes with a number of different characters that really feel different when you play them (except the two mages, they feel a little “palette swapped”). But each character really forces you to approach the game differently. The designer did a great job of making each character feel thematically unique. The cleric has a lot of healing and defensive spells, while the rogue is really good at backstabbing. I really enjoyed the nice touches like this. Finally, I want to talk about who Mistfall is for. At its heart, I think Mistfall is a very thinky, puzzle like game. You have X number of cards in your hand you have to figure out how to do enough damage to kill all of the monsters in front of you this turn. Do I play this card here and then this one there? Or maybe I should buy this upgrade first to allow me this cool combo. One of the great things about the upgrade system is that any card you buy is playable immediately. Often I’d find myself looking through the upgrade deck trying to puzzle out how to get just one more point of damage. If you are looking for the standard: roll dice, apply hits, fantasy game than Mistfall is not for you. However, if you like games where you have to use your wits and strategy to overcome challenging encounters, then this may be your baby. The game is very icon and text dependent, which doesn’t make learning the game any easier. Despite my criticisms of the rulebook and errata issues, I found myself constantly being drawn back to the game. Once I got a solid feel for Mistfall, I actually enjoyed the game quite a bit. This is a great amount of variety, some stellar artwork, and challenging game play. Since Mistfall’s play time runs a little long, I tend to prefer it with 2-3 players. If I play a solo game, I usually run two characters. Ultimately though, you need a bit of dedication to really enjoy Mistfall. 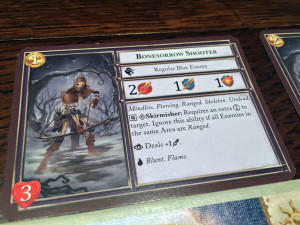 The rulebook and card errata are absolutely going to be a barrier to entry for new players. Right now, this isn’t a game you’re going to be able to plop on the table and dive into quickly. The game relies heavily on icons and text, so even with a solid rulebook; the learning curve is still a bit high. Expect to expend a dedicated effort to not only learning how to play, but to win the game. But if you can do that, then you will be rewarded with a very thinky and solidly fun tabletop game. If you enjoy games like the Lord of the Rings card game, Legends of Andor, and the Pathfinder Adventure Card Game, than Mistfall might be right up your alley. Here’s hoping the publisher release a “how to play” video and updated PDF of the rules. If you’d like to pick up a copy of this adventure game, you can get it for about $50. 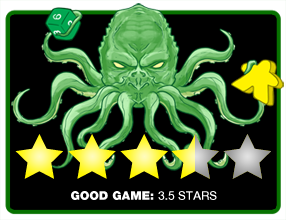 Final Scores: 3.5 Stars – Once you can get past the rulebook and wrap your head around the game play, you’re rewarded with a thinky and entertaining card game. • Characters and monsters are thematically done. I think you just sold me on Mistfall! Great Review.